Circlets are typically “earned” as a Priestess goes through her “steps” in training. The criteria is different from circle to circle, yet the meaning remains the same: it is a mark of success in her training. 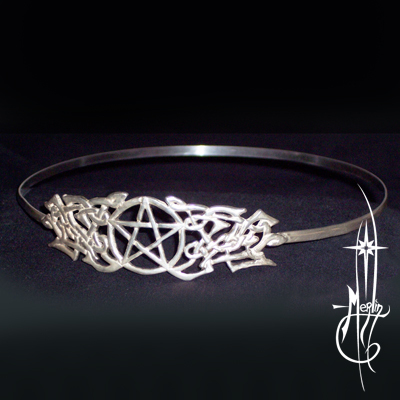 This Priestess Circlet is of original knot work: each bend and fold of the knot was specifically designed for the Priestess and was not re-created for anyone else. The central star is the classic woven Pentacle beginning and ending at the top representing that all thing come from and rely on the Spirit. The knot work on each side is of flames, representing the transformational qualities of the work involved when wearing it in circle: both of the focused tasks and the transformation of the Priestess Herself. This now resides in the collection of the Priestess Herself, the image she took for me to share with you. Should you wish something like this made for you, be sure to see my How to order Custom page.